The Woodmouse is Britain's most common rodent. Also known as the Long Tailed Field Mouse, the Wood Mouse is Britain's most common rodent and is found throughout Britain in many different habitats including woodland and farmland, although it tends to avoid very wet areas and exposed uplands. It is characterised by its dark brown upper fur, grey or white underside, large eyes (it is mostly nocturnal) and large ears. The body is some 8-10cm in length and the tail almost as long at 7cm. It eats a wide variety of food including berries, seeds, nuts, fungi, buds, caterpillars and other invertebrates, depending on the season and what is available at the time. Population levels are found to rise and fall depending on how much food is available to them in the autumn. In particular, a good year for acorns means greater numbers of adult mice will survive through to the next summer, although most woodmice live for less than 12 months, usually succumbing to predation. The varying population of woodmice from year to year has an effect on the breeding success of owls who prey on them. 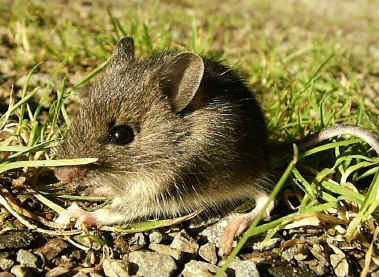 Woodmice are also an important food for many carnivores such as foxes, weasels and stoats. They are usually found in large numbers within suitable habitats. Birds-of-prey also feed on woodmice. 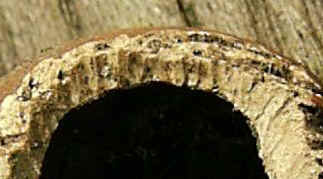 Woodmice often have complicated burrow systems beneath tree roots, with food storage chambers and nest chambers. However, their nests are sometimes built above ground in places like hollow tree trunks or holes in old buildings. They are usually made with moss, leaves and grasses. Woodmice are often communal during the winter when they feed from their food stores, but disperse during the spring when each female takes on her own territory. Males will visit many females as they move about within a habitat. Up to six litters of young numbering 4-7 are normally born between March and October, although woodmice will continue breeding into the winter if food is plentiful. They are born with their eyes closed and without hair, but grow quickly and within weeks can be breeding themselves. You can tell if woodmice inhabit an area by looking for evidence of their eating habits. Look for empty shells of hazel nuts on the forest floor, Although lots of other animals eat hazels including squirrels and dormice, the woodmouse has a characteristic way of getting the nut out of the shell. It gnaws a roughly circular hole in the shell, but characteristically its teeth marks all point downwards, unlike those of the dormouse which radiate outwards from the centre of the shell. 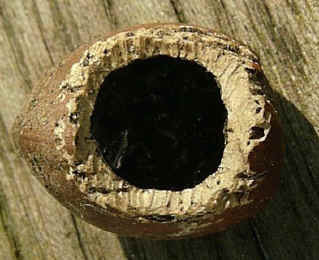 Note that all the toothmarks point downwards on this hazel nut shell, indicating that the nut has been eaten by a Wood mouse.